How is it possible to graduate from a Master’s program in three years with 44 extra credits, while holding three jobs? And do this in a country where only a fifth of all university students reach the target time of five years? I will tell you. Almost three years has passed since I posted the picture above on Instagram. 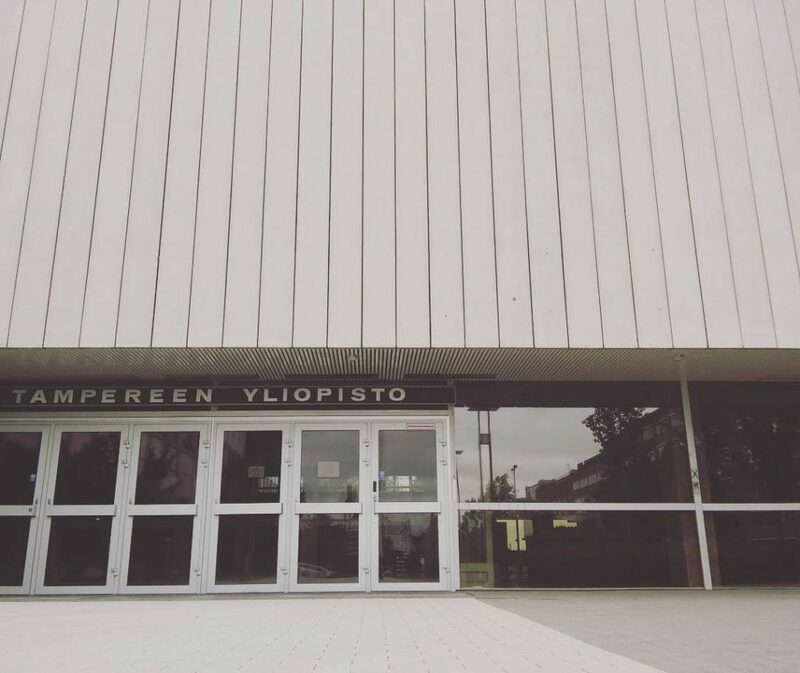 It was my first day at the University of Tampere, the day I started my journalism and communication studies in Finland. Already back then I knew I wanted to do something that I had heard only rumors of. I wanted to finish my university studies under the target time of five years. Understandably, my goal was difficult to achieve and I faced a lot of questioning, especially since I had three jobs at the same time. My study advisors, teachers and fellow students were not used to someone like me. In Finland, students usually don’t graduate in the target time, not to speak about being quicker. But that is exactly what I did. Pulling of something like this is not an easy task. However, I had some benefits that made things easier. One was the fact that I had completed all the basic courses at the open university before starting my actual university studies. At the time I didn’t realize how much of an advantage it was for me, yet during the first year I quickly realized its value as I was able to participate in second-year courses. 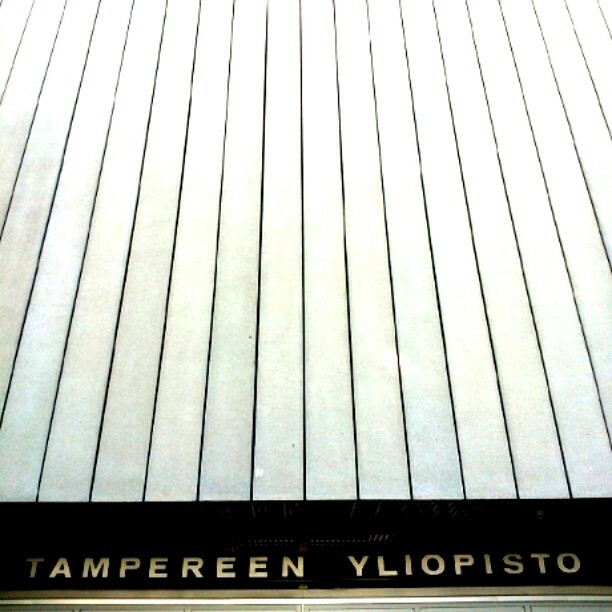 Another benefit was the Tampere university’s preeminent system of free minor studies. Basically, I could enroll myself on any course from any faculty and make it a part of my Bachelor’s studies. Thanks to this, I completed 224 study credits (ECTS) within two years instead of the 180 credits required within three years. 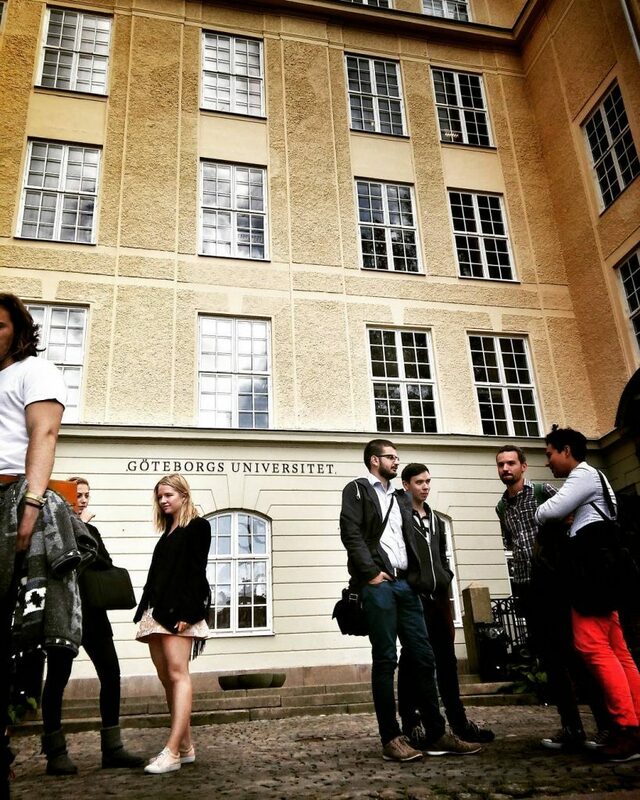 Thirdly, having a possibility to complete a Master’s thesis in Sweden in one year was an opportunity like any other. Having these possibilities and benefits were only a small part of the whole picture, though. To be able to to do what I did a lot of work and planning is required. Here are some of my tips and tricks, something that took me several years of modifying. It required self-discipline as well as knowing my own strengths and weaknesses. Being organized is going to require the same things from you. Besides studies, these rules can also be applied to a freelancer’s job. I carry notebooks with me wherever I go. All four of them. To me, notebooks are like folders: one notebook for one category of thoughts, or, in the case of university studies, one notebook per course. As an average university student has four courses per period, I had eight to ten. Keeping track of all their deadlines and lectures in an organized way was a key to starting and completing all of them. The important thing is not to have a notebook or several. The important thing is the purpose they serve: clearing the cache inside your head. The human brain is amazing in how many things it can handle at the same time but what it is less good at is holding on to all those threads of thoughts. Trying to remember everything eats up a huge part of your energy and efficiency. Stressing about that you forgot something does the same thing. Getting ideas, thoughts, feelings and unfinished processes safely stored helps you keep focus on what you want. At the moment, my online calendar consists of six synchronized, color-coded calendars. Having different timetables synced helps me and others keep track of when and where we need to be or what needs to done by what deadline. The calendars consist of two different kind of markings: time-bound events (e.g. meet an interviewee at 3pm) and day-bound events (e.g. buy flight tickets to Helsinki). Time-bound events are what dictate the daily schedules and day-bound events are the to-do list. To-do lists are handy, but only if you make them right. Instead of having everything as one long overwhelming list of tasks, divide your tasks evenly throughout the week. Set a deadline and stick to it. A daily to-do list will help you prioritize and keep your mind on what’s important. Especially essay and exam deadlines. One tool that planner freaks like me use is the spreadsheet. Especially long-term projects and courses that last for more than one period, it might be difficult to keep track of everything only with the help of a calendar. And this is where spreadsheets step in. 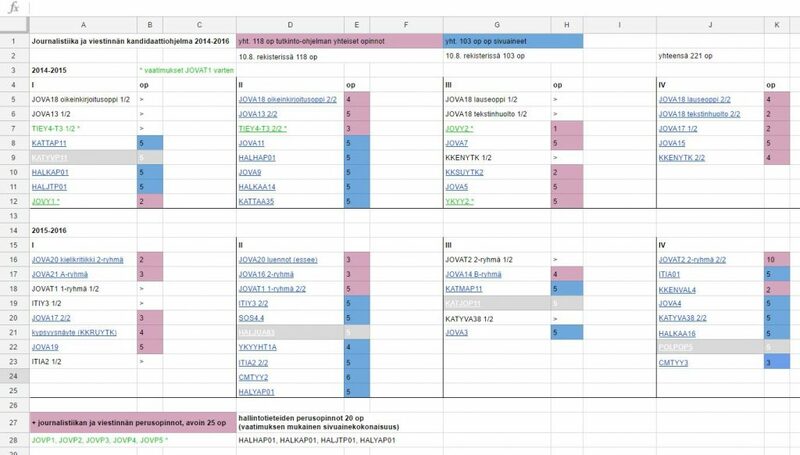 The picture below shows a spreadsheet in which I kept track of my courses and credits. Everything needed can be seen on one climbs. This would be impossible to comprehend and update only with the help of a calendar. Take to notion that having a properly functioning spreadsheet needs constant updating. It might feel like a boring thing to do and you might think that you can do it later. Don’t. You’ll lose track of what you have already updated and checking up on things two months old eats up more of your time than giving two minutes a day to one simple update. Never delete or destroy anything. These tools are not meant only for keeping you on track right here and right now. They are also tools for you to check on what you have done and tools to help you get back to what you need to remember. Sometimes getting started is the most difficult part. Instead of pondering whether you should do something or what you should do, just do it. It takes less time than wondering around. Trust me. And once you get to doing, keep going. No task, thought or event is too small to for these tools and rules. Write everything you need either in your notebooks (or what ever suits you best), calendar or spreadsheet. A journalist’s job is not only a job. It’s a profession that doesn’t count hours. A freelance journalist cannot expect workdays to be 8 hours long because sometimes even 12 hours aren’t enough. I feel the same about studying. Now I realize that not everyone is like me. Not everyone has the same desire and passion for studying that I do, and thus these tools and rules don’t work for everyone. That’s okay. I don’t expect the same things from others that I expect from myself. Yet I feel that it is important for me to show that university studies don’t have to be dragged out necessities that throughout the years evolve from something manageable to something tedious. 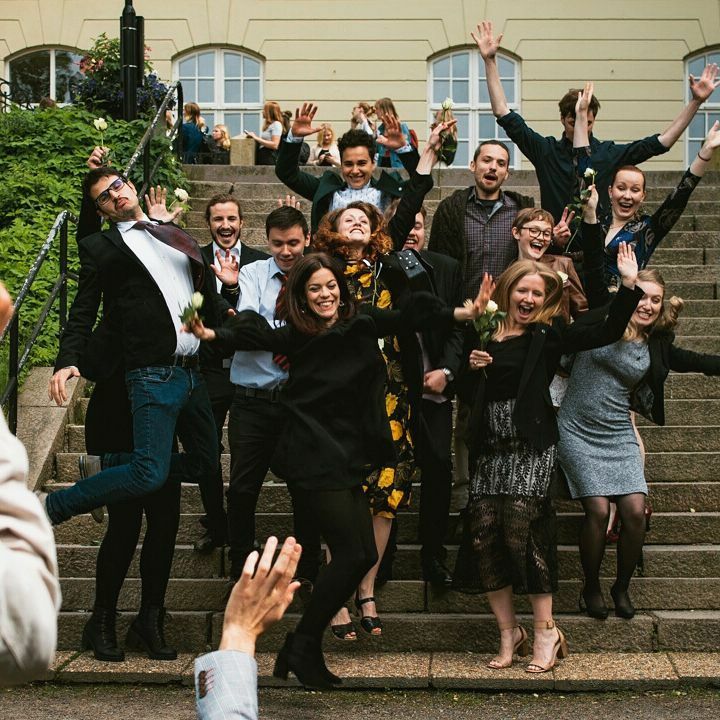 When only 10 to 20 percent of all university students in Finland are able to grduate in the target time of five years, I can’t help but think that there’s a problem – in the university system, society or the students themselves. Which one are you going to change? The writer started her university studies in 2014, graduated as Bachelor of Social Science in 2016 from the University of Tampere in Finland and as Master of Social Science in 2017 from the University of Gothenburg in Sweden. Currently she works as an editor-in-chief and as a translator. 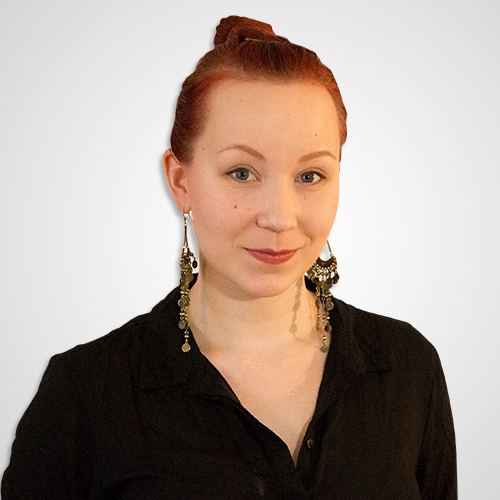 Find her portfolio and work samples at Göteborgin Sivukonttori and at Varusmies-lehti.